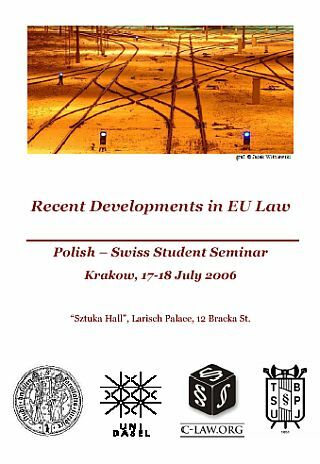 Centrum C-Law.org in cooperation with the University of Basel Chair of European Law (Switzerland) and with assistance of EU Law Division of TBSP Jagiellonian University students’ association organizes an international seminar devoted to most recent changes and directions of evolution visible in a constitutional framework of the European Union. The objective of the seminar is to explore current trends in EU law and discuss significant judgments issued lately by the European Court of Justices and often not yet exhaustively analyzed by legal scholarship. Variety of students’ backgrounds, coming from different legal systems and from both within and outside of the European Union, is expected to provide a stimulating academic environment and encourage comparative approach of the discussion. We will be happy to welcome Mr Mirosław Wróblewski, acting as Director General at Małopolski Urząd Wojewódzki in Krakow (governor's office for the region), as a seminar guest. Mr Wróblewski is a specialist in the field of EU law. The seminar will take place in the historic center of Krakow, in one of Jagiellonian University buildings located at 12 Bracka Street (Larisch Palace). You can find the detailed programme of the seminar here.